A newlywed bride, a novice cook, wanted to make polo (fluffy steamed rice) but did not know how so she reluctantly turned to her mother-in-law (MIL) for help. “First you wash the rice,” the MIL instructed. The bride nodded and said: “Yes, I knew that part already.” “Then you soak the rice in lightly-salted water for a couple of hours.” the MIL continued. “Um-hum, I already knew that too,” said the bride. “Then you cook the rice in boiling water until the grains get tender.” To which the bride replied: “Yes, I knew that part as well.” And so on, and so forth! Whatever instructions the MIL gave, the bride, who was loathe to reveal her inexperience, replied: “Oh yeah, I knew that already.” Vexed, the MIL decides to teach the bride a lesson and says: “And lastly, put an adobe brick on top of the rice, cover, and cook for an hour.” And the bride says: “Yes, of course, I knew that part already as well,” and goes off and prepares the polo as instructed and makes a disappointed fool of herself when the disintegrated brick ruins the rice! The story is reduced to a punchline of “yeh khisheh ham roosh bezar” or “put a brick on top” — used when someone is faking it till making it. So here’s the first lesson when it comes to making an awesome Persian fluffy rice: Do NOT put a brick in the pot! There! You’re already one huge step ahead. So what exactly constitutes a fit-to-be-served-in-company polo? The standards are exacting and precise: the perfect polo is fluffy and pillowy and billowy and it is doon doon (each grain is separate from the other, none sticking, heavens forbid, to each other) and the grains are rosht kardeh (each grain fully grown & lengthened in the process of cooking) and textured so that it is neither overcooked nor even the slightest-bit crunchy, perfectly seasoned and fragrant with saffron of course, AND, with the perfect golden crispy crust of tadig. Verily, it is a skill one can rightfully boast of once one masters the technique. For those unfamiliar with making Persian-style rice, don’t let me scare you off, because while technique-driven, the steps entailed (once learned and practiced a few times) allow for facile adoption in a second-nature, no big-whoop way. My mom can throw together a rice dish – that is so pretty and delicious it will make you weep tears of gratitude – with perfect nonchalance, and in an almost time-defying Matrix type of way … so to speak. I, on the other hand, … let’s say I am still working on being cool and carefree when making polo. But hey, practice makes perfect, and this is one of those things that’s fun to practice, right? My proposed plan-of-attack in helping you master the method of making the perfect Persian polo and kateh and tadig is to cover the actual nitty-gritty techniques of it all in exquisite detail in a couple of future posts. But for now, first steps first, let’s take a quick explanatory spin for those of you not familiar with Persian cuisine. 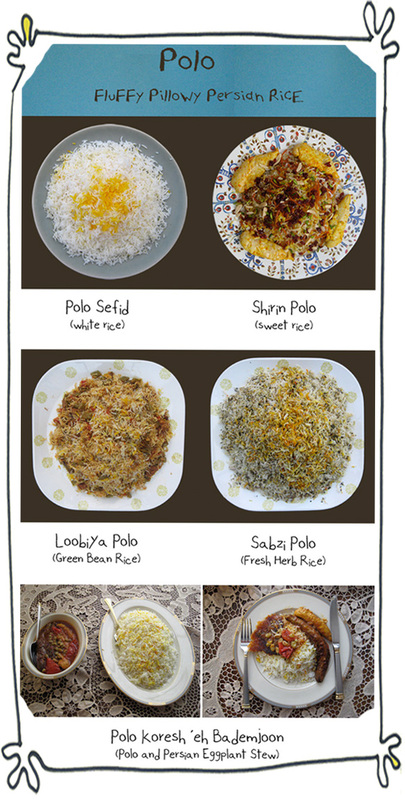 Polo is steamed Persian rice – fluffy and fragrant – made with the best quality rice one can find, following a multi-step process that includes: washing, soaking, boiling, draining, followed by steam-cooking — each step with its own traditional rules of engagement. (By the way, polo is pronounced thus: “po” as if you’re saying Edgar Allen Poe + “lo” as if you’re singing: “Her Name Was Lola.” ♫ At the Copa, Copacabana … ♫ … Such a catchy tune!) Ok back to our regular programming. Polo Makhloot = mixed rice. This type of rice could be anything from shirin polo — which is the poor man’s javaher polo (jeweled rice – served at weddings and for Norooz) to, oh, rice mixed with lentils, berberries, cherry, sour cherry, fava beans, green bean polo or … a whole bunch of other things. Polo Sefid = plain white rice. (Except that there’s nothing plain about it, as it is customarily fragrant with saffron and a delight.) 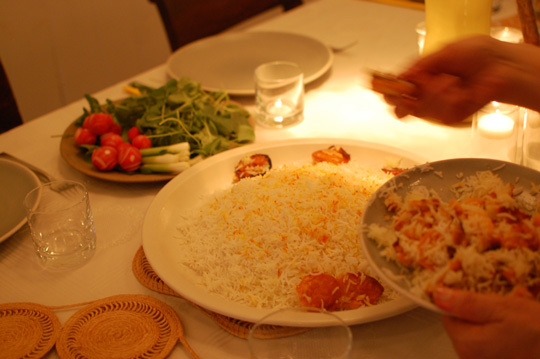 Plain polo is usually meant to be served with khoresh – the combo of the two generically termed: polo va khoresh – constituting what may as well be the national dish – and probably the most delectable genre of Persian food. Polo is what you make for guests, for special occassions, for a good dinner at home when time permits. 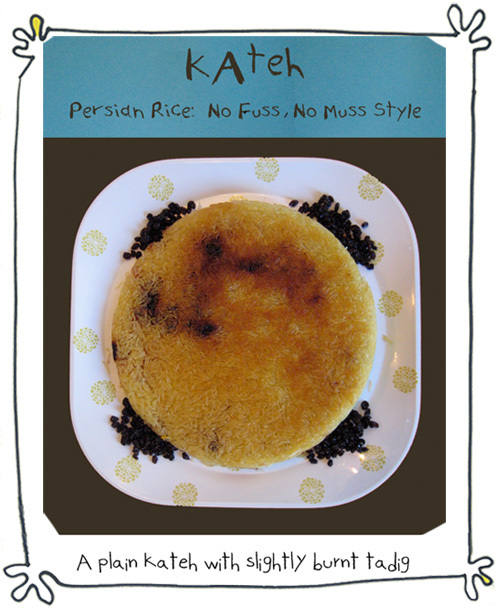 If pressed for time, or just not in the mood, it’s Ok to make a version of Persian rice called kateh that is much less fussy – dispensing with the whole parboiling and draining and steaming rigamorale. Kateh is basically a humble, hurried poor cousin of polo. It’s not as “fancy” but you still end up with rice that is not sticky and also has that indispensable golden tadig crust. Ah, tadig. 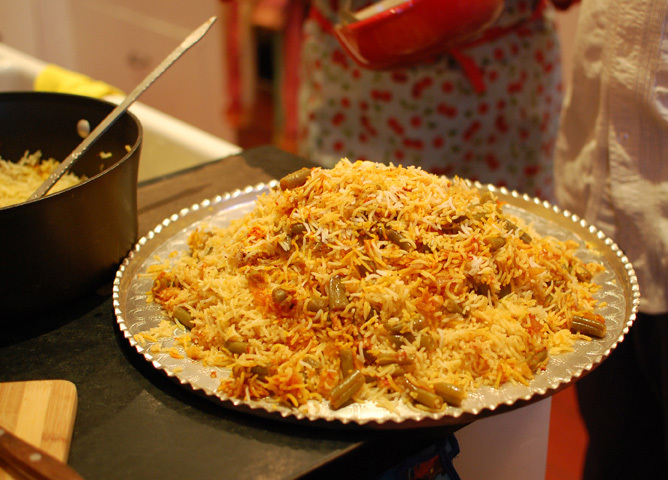 Glorious, glorious tadig. What is it? 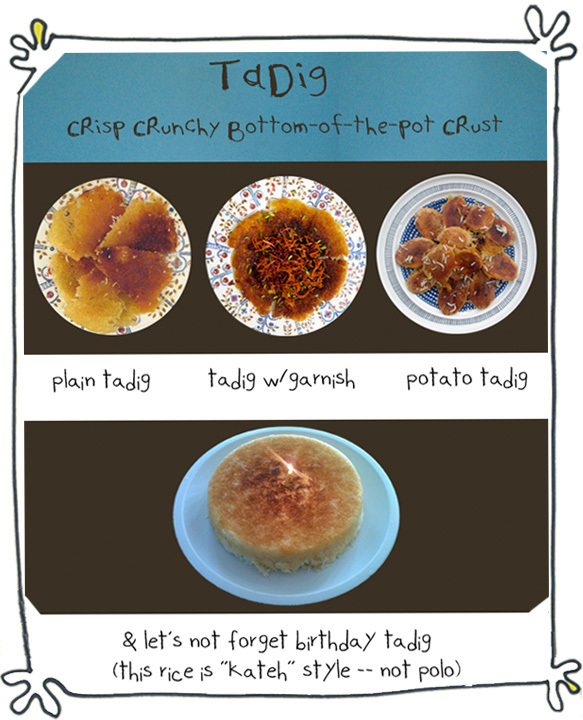 Well, dig is pot and tah (shortened to “ta” in daily informal speech) means bottom — so tadig literally means “bottom-of-the-pot.” But as the unique invention and pride of Persian cuisine its place is top notch. Iranians LOVE their tadig. And honestly, so do most people once they get a chance to give it a try. It’s pretty awesome. All to be posted in due time. Hope to see you then! Wowie, looking forward to the future posts on how to make polo, kateh and tadig . :D. The photographs are making me quite hungry I gotta say! My intentions are good, hopefully my actions will follow suit, in which case the promised future post should be up before too long. Hehehe…well no one can blame you for getting hungry while writing that post ;). I’m probably about 25% competent with polo, tahdig works, but neither you nor the MIL would accept my result (using electric Pars Kazar cooker from Ryde, Sydney via Iran). I look forward to next lessons. Perhaps, if it’s acceptable, you might include we electric folk? I DID ask the shop for a Persian rice pot, expecting a stove top one and that’s what they had on the shelf. Hi Ross – that’s funny about your MIL but trust me, I’m much more forgiving! It’s very interesting that you mention the electric cooker – what we call “polo paz” – because I do plan to mention it and its use, so stay tuned! I’m curious whether you use your cooker to make only plain polo or mixed ones as well – and how you like the cooker in general. Hi, not my MIL–a much loved French/Italian woman who was born in Cairo, married to a British officer and lived there until emigrating to Australia, but your mythical one. I make both plain and mixed polos, always vegetarian. The instructions for the Pars Kazar are in Farsi, thus a closed book for me but I’ve figured out cooking times. This cooker has a shaded timer dial which suggests the likely cooking of the tah dig. It was quite expensive relative to the commonly available Chinese rice cookers but I understand that it is programmed to work quite differently. It did work fine first time and since then, no disasters when guests are coming. Thank you for this great presentation, Azita! I cannot wait for the next couple of posts; as you already know, I am yearning to learn more about making perfect polo! OH my goodness! Several years ago I was very involved inTae Kwon Do. A fellow black belt in the school was studying Robotics at the University, he was from Iran. He had the sweetest little family and hosted several dinners for me and another friend. His wife, Farnoz was a wonderful cook and I’ll never forget the rice. I remember the potatoes and especially the crispy crunchy bottom of the pot crust. You really took me back to her table and what a fond memory! What a lovely story! No, really, what a lovely story. I can picture those dinner parties and I’m thrilled that this post took you back there. And wow, you are into Tae Kwon Do? Very interesting. I’ve flirted with the idea – never serioiusly – but have utmost regard/admiration for those who undertake it. Thank you for a comment that made me SMILE! Oh this is wonderful, I just love Persian rice and tahdig is the best, especially the potato tahdig. I had completely forgotten about one of my favorite dishes Loobiya polo, I used to make it all the time. There is a definite art to making perfect Persian rice and I think its the best rice ever. Great post. I also noticed I have been misspelling bademjoon, another of my absolute favorite dishes. Oh Suzanne, loobiya polo and khoresh bademjoon are really among the more delicious types of rice and khoresh and as you and I both know, that’s saying something. both are my favorites as well. Loobiya polo b/c I think that with that combo of tomato and all it just get really nice and succulent and moist … oops better stop I’m making myself hungry again, ha ha. Knowing you, I can only imagine how good your loobiya polo was. We really should cook together one of these days. Now I really want to make loobiya polo, I think I made it with beef. It’s been so long I can’t remember. Do you have a recipe. Yes, lets cook together. I would love to. I am in rice heaven! ha ha, thank you. you know Maria, if there’s a heaven, I’m sure there’s some good rice there and we can eat it and eat it and not get fat either. Great post. I’m hooked, can’t wait for part 2. I’m a huge rice fan and cook it in many styles, look forward to adding “polo” to my repertoire. So happy – thank you! Wow, can’t wait for the other posts! Must make mental note not to serve rice when you pop over to my exclusive café, with almost sea view. When summer arrives! Although, earlier this afternoon was delightful. Won’t last! I love you. Seriously. Love this woman. She takes on the Herculean task of polo and tadig with patience, humor and unparalleled wit. Mashallah, 1,000 Mashallah. You da bombdiggety. (We take our rice seriously and have been known to arm wrestle for tadig.) Merci, Khanum. May a whole new audience know the glory of Persian rice, thanks to you. Nostalgic opening story and detailed 101 on polo is impressive. Well you already know how I feel about you returning to these Internetz and gracing us with your presence and fully and totally appreciate your sweet comments. Mersi! Wow! Fascinating and amusing post on rice!!! Lovely photos as well. I can’t wait for the others to get posted! Chef Mimi – I do hope you’ll like it. I’m curious and intrigued to see how Persian rice will fare in the hands of talented bloggers once the technique is picked up. Just when I thought this dish/technique couldn’t be more perfect… potato tadig!? Is that from potatoes cooked at the bottom of the rice pot? I’m drooling looking at the pictures, and anticipating the ones to come! Azita, I popped in to say that I’m posting a step by step recipe for ghee for you. Halwa to follow in a bit. ha ha, yes, you were a stealth-covert tadig maker, except no one knew it! 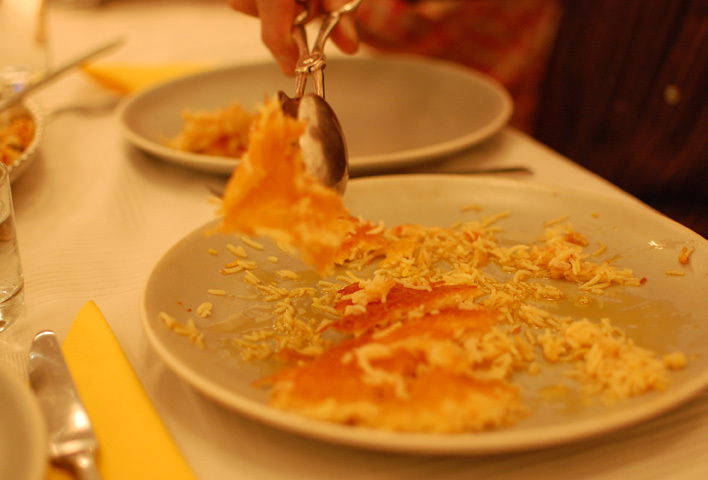 psychd to hear about the ghee post – and guess what, my mom says that ghee is pretty fantastic to use for tadig making so your post can come in quite handy. Look forward to checking it out + can’t wait for the gourd tutorial either! This is a great post! I do not know absolutely anything about Persian cuisine and there is no better way to learn than to start from the basics. I love rice and I look forward to your next posts. I loved the story about the MIL. It is so amusing and wise at the same time. Hopefully, you will share more Persian stories so I can learn more about your proverbs and legends. Polo Sefid is called CHELO. Polo is called to mixed rice. In the interest of clarity, I made an editorial decision to omit mention of chelo. As they say, beineh olama ekhtelaf hast. Thank you for reading and commenting. Persian rice is the best, I will have to agree! 🙂 Thank you Shanna! I do not recognise who you might be however definitely you’re going to a famous blogger should you aren’t already. However, I should like to add something that comes to my mind regarding “Polo Sefid”, meaning “white polo”. 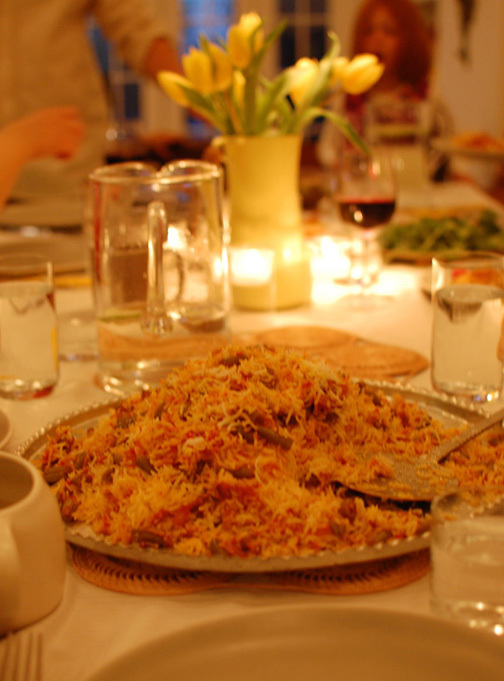 Pilau or the Persian version “Polo” mainly refers to the seasoned dish of rice and vegetables and meat. Yet, in Persian the word “Chelo” may be used to refer to “white rice” instead. The term is employed in combinations such as “Chelo Kabab”, “Chelo Morgh” or “Chelo Kareh”. I enjoyed your posts. They are well-categorized with beautifully-phrased descriptions.